Updated 11th Dec 2014; This restaurant is closed according to Urbanspoon.com. I had lots of leave accumulated from last year. Believe it or not, I have almost 6 weeks of leave which I need to clear by the end of this year. So, HR sent a note to everyone that we had to now use a certain number of days by June 30th or we lose it. The only way I could use it without really impacting my project is to take a day here and there. So, I took a day off mid week to meet up for lunch with someone I had always wanted to meet. He is known as fmed as a commenter on chowtimes. Fmed is a prolific foodie and very active around the local food blogs and forums using other names. It was only recently I managed to piece together who fmed really is. We decided to meet up at the Sweet Chili Cafe, a place we had always wanted to try twice before only to find out that they were closed on Sundays. 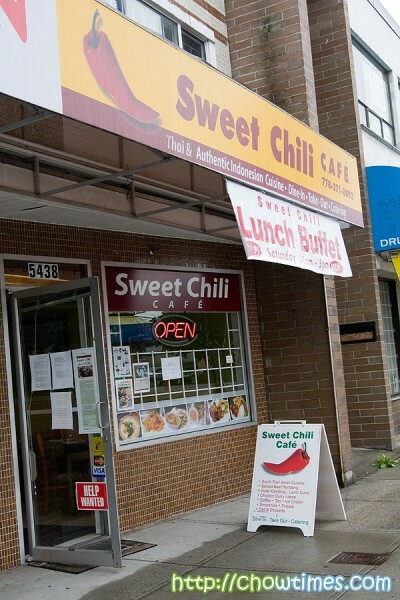 Although the sign outside the restaurant says “Thai and Authentic Indonesian Cuisine”, to me the Sweet Chili Cafe is more of an Indonesian restaurant. Like they say, the best things comes in small packages. The Sweet Chili Cafe is small having only 6 tables in all, each spread with batik as a table cloth. This place is owned by Angeline Tan, a very friendly delightful lady. The moment she saw me taking my camera out of the bag, she immediately asked “are you doing a review?” like she was expecting me to. I said no with a smile and that I just like taking pictures of my food. She knows. I like her already because I know she has a lot of stories to tell … all I had to do is to ask. Angeline told us she is part Indonesian and part Chinese. The decor and menu reflects that. 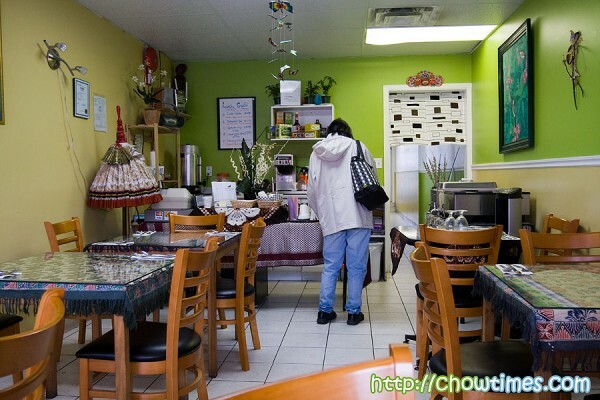 The Sweet Chili Cafe is actually the smaller newer incarnation of the Bali Restaurant on Broadway which had won awards 2 years in a row from Georgia Straight for Best South East Asian Food. I read this on one of the many newspaper clippings that Angeline framed up in her restaurant. I actually thought it kind of strange that she changed the name of an established award winning restaurant and started afresh with a new name on a new location. I thought it was intrusive and impolite to ask, so I did not. We ordered drinks. The Es Cendol is a popular cold drink in Malaysia sold mainly by the Indians community. I was not sure it was also a common drink in Indonesia too (is it?). 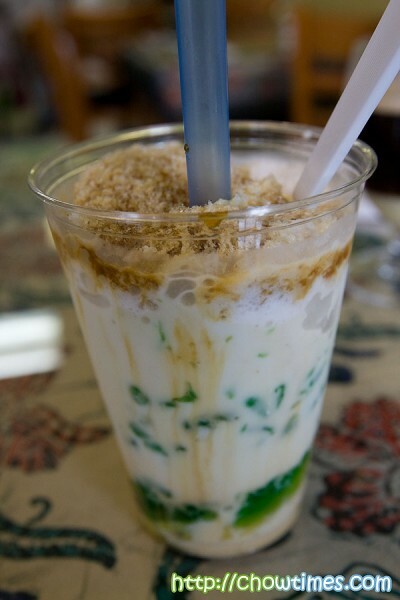 The word cendol refers to the greenish pandan flavored starch noodles at the bottom. This is served with coconut milk and palm sugar (the Malaysians insist on calling this gula melaka while the Indons calls this Gula Jawa!) — that is all one need to call this Cendol. This is a great drink for a hot day. 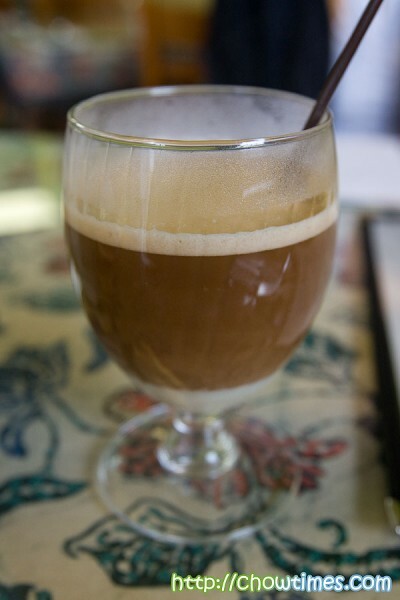 It is a rich but not overly sweet drink. The cendol here is served with a tinge of saltiness which adds a bit of a element of surprise.